Personal Claim to Fame: Buying my first house on my own. Inspiration in Life: My mother, she is strong-willed and never gives up. Hobbies: Fishing, hunting and slow-pitch softball. Pet Peeves: People who are noisy eaters and people who are smart mouths. 3 Words to Describe You: Very happy, funny and outgoing. If You Could Have 3 Things on The Island What Would They Be and Why? A North Carolina flag—it’s where I was born and raised and is the greatest state; my softball jersey—the name of the team is my brother’s nickname and he is the one who taught me to be a strong competitor and never quit; and a letter from my mom—she is my hero and has taught me to be the person I am today. 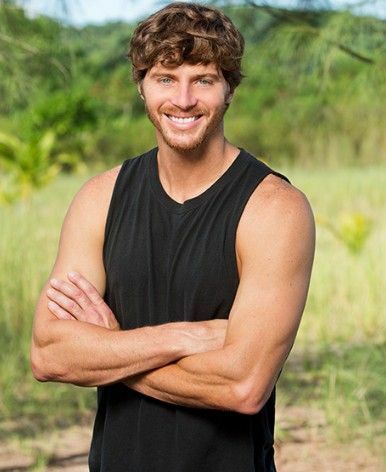 SURVIVOR Contestant You Are Most Like: JT, because he is nice ol’ country boy who everybody loved, and Malcolm, because he is strong at challenges and very likeable. Reason for Being on SURVIVOR: I want to prove to the world that a country boy can survive and win the million dollars. Why You Think You’ll “Survive” SURVIVOR: I know how to build, fish, hunt, build a fire, and am very strong at challenges. Why You Think You Will Be the Sole SURVIVOR: I will be very strong at challenges, able to win individual immunity, easily make alliances and never give up. Who Do You Think Has the Best Chance in the Game of Survivor: Brains, Beauty or Brawn? Honestly any tribe could win. If a Brain, they know how to talk and how to present the game in different ways to change people's thoughts and decisions. If a Beauty, looks and flirting sometimes goes a long way. Most of the time a girl can change a guy’s mind easy with looks and flirting. If a Brawn, being strong and winning most challenges can put you in the final three easy!! My answer would be any tribe. It is just who is coming to really wanting to win the million. The guys in beauty this season is way too disappointing this season. With that said, he needs a good shave and he will look like Zac Efron. Anyway, I'm totally repeating myself on this (BECAUSE I LOVE THIS CAST SO MUCH ), but he seems really nice, able to make friends fast and obviously a force in challenges. I'm more disappointed of his hair than his personality. I want him to do well despite what other people think, I like him. He's kind of become a favorite of mine now. Not the smartest of the bunch, but he's light-hearted and could start making moves now if he wanted.